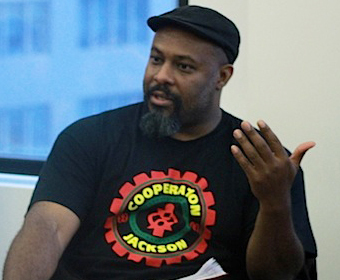 Kali Akuno: First and foremost, it is critical to understand that the Malcolm X Grassroots Movement is a revolutionary nationalist organization that is part of the New Afrikan Independence Movement. Revolutionary nationalism is a left-wing variant of nationalism, practiced by colonized and oppressed peoples, that seeks to liberate them from the yoke of their colonizers and oppressors and replace the capitalist-imperialist social order imposed upon them with a socialist social system. The New Afrikan Independence Movement is a multi- tendency movement struggling to liberate the southeastern portion of the so-called mainland territories now colonized by the United States government. The New Afrikan Independence Movement recognizes that territories it is claiming for its national territory rightfully belong to the indigenous nations of Turtle Is- land, and makes no claims that supersede their just claims. However, our aim is to unite with indigenous peoples and with other oppressed peoples throughout the United States empire and break the back of white supremacy and the settler-colonial project through a unified anti- colonial, anti-imperialist, and anti-capitalist struggle. So, it is critical to understand MXGM, and its parent organization, the New Afrikan People’s Organization, and their commitment to the South in this context.